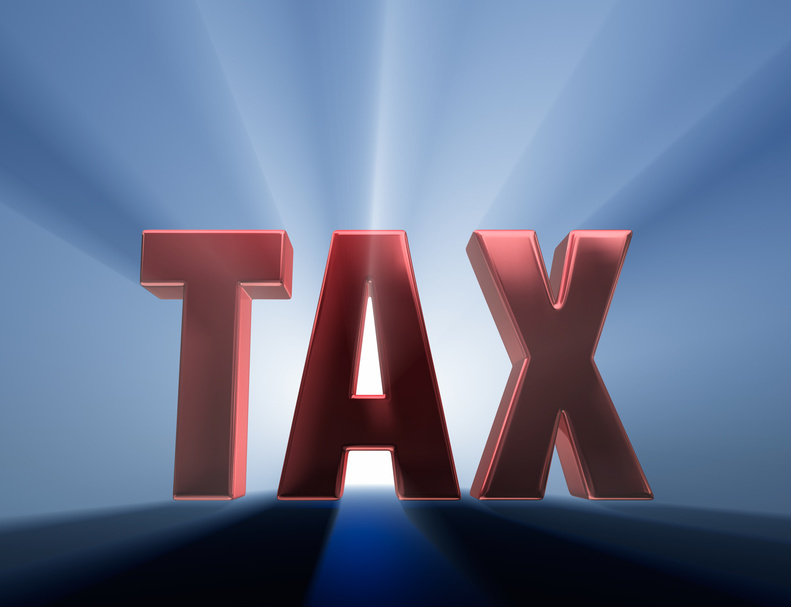 What's The Best Tax Strategy …Tax-free or Taxable Interest Income? 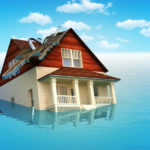 Home » Private: Our Blogs » What’s The Best Tax Strategy …Tax-free or Taxable Interest Income? A frequent tax strategy question is whether investing for tax-free or taxable interest is better. Generally, taxable interest will provide the greater return, but this may not hold true after taking into account taxes on the income. This is especially true for higher-income individuals now that we have the healthcare legislation’s new 3.8% surtax on the net investment income of higher- income taxpayers, which is discussed below. • Municipal Bond Interest – Interest earned from states’ and local governments’ general purpose obligations, which are issued to finance their operations, are generally tax-exempt for federal purposes. However, the various states usually only exempt interest from bonds issued from the state itself and from local governments within the state. Hence, two categories of municipal bonds exist, namely the tax-free federal and state ones and the tax-free federal-only ones. Individuals can invest in municipal bonds by directly purchasing bonds or through funds that invest in municipal bonds. Some funds invest in bonds issued in a particular state only, providing residents of that state with income that is excludible on their state returns. In general, tax-free bonds are likely to be more attractive to taxpayers in higher brackets, as they receive a greater benefit from excluding interest from income. For lower-bracket taxpayers, on the other hand, the tax benefit of excluding interest from income may not be enough to make up for the lower interest rate generally paid on this type of bond. Even though municipal bond interest isn’t taxable, it must be shown on the return. This is because tax-exempt interest is taken into account when determining the amount of Social Security benefits that is taxable, and it may affect the alternative minimum tax computation as well as the earned income credit, investment interest deduction and sales tax deduction. • Tax-Deferred Retirement Accounts – It generally doesn’t make sense to buy and to hold municipal bonds in your regular individual retirement account (IRA), Keogh or 401(k) plan account. The income in these accounts is not taxed currently, but once you start making withdrawals, the entire amount withdrawn is likely to be taxed even though it includes income from tax-free sources. Thus, if you want to invest your retirement funds in fixed-income obligations, it generally is advisable to invest in higher-yielding taxable securities. • Alternative Minimum Tax (AMT) Consequences – Even though interest on municipal bonds is generally excluded from income for purposes of the regular federal income tax, interest on certain “private activity bonds” is included in income for purposes of the alternative minimum tax. Your broker can tell you whether the particular bond you are considering is a private activity bond subject to this rule. The alternative minimum tax is a separate tax system that applies if the tax determined under that system exceeds your regular income tax. 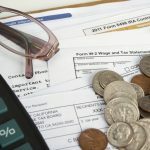 Whether or not the alternative minimum tax applies will depend on your overall tax picture; however, in general, the alternative minimum tax’s effect would be to prevent you from achieving too low of an effective tax rate by means of tax-favored techniques, such as investing in municipal bonds. This office can help you determine how the alternative minimum tax would apply to your situation and how it would affect the after-tax yield if you were to invest in municipal bonds. • Effect of Exempt Interest on Taxation of Social Security Benefits – In general, a portion of Social Security benefits is taxable if your adjusted gross income, subject to certain modifications, exceeds specified amounts. For this purpose, the modifications to adjusted gross income include adding in tax-exempt interest. The effect of this rule is that if you receive Social Security benefits, investing in municipal bonds could increase the amount of tax you have to pay with respect to the Social Security benefit. While the municipal bond interest technically remains exempt from tax, the effect is the same as if a portion of that interest were taxable. One technique to solve this problem is to invest in tax-deferred, rather than tax-free, investments. For instance, income earned via an annuity is not taxable until the annuity is cashed in and thus would not impact the Social Security taxation except in the year cashed in. We can assist you in determining the impact of tax-free income on the taxability of your Social Security benefits. • Effect of Exempt Interest on Earned Income Credit – If you are otherwise eligible to take an earned income credit, you will lose the credit completely for 2013 if you have more than $3,300 of “disqualified income,” generally, interest, dividend, non-business rental, passive, and capital gain net income. Disqualified income includes tax-exempt income. Thus, municipal bond income could cause the loss of the credit. However, in most cases, an individual who is eligible for the earned income credit will be in a low tax bracket, thus making municipal bonds an unattractive investment in view of their lower yields. Disqualifying income can be avoided by using tax-deferred investments, as discussed under Effect of Exempt Interest on Taxation of Social Security Benefits above. • No Deduction for Interest on Obligations Incurred in Connection with Tax-exempt Investments – If you borrow money for the purpose of investing in municipal bonds, you can’t deduct the interest expense with respect to that borrowing. Moreover, even if the proceeds of borrowing are not directly traceable to tax-exempt investments, interest deductions could be disallowed if the Internal Revenue Service (IRS) could establish that you continued the borrowing in effect (that is, you didn’t pay it off) for the purpose of acquiring or carrying the municipal bonds. If you have otherwise deductible interest and invest in municipal bonds, the result of this rule, by denying a deduction for interest paid, could be effectively to tax the municipal bond interest. • No Deduction for Investment Expenses Related to Tax-exempt Investments – If you itemize your deductions, you may deduct the costs of investment advisory, custodial or agency fees if your total miscellaneous deductions exceed 2% of your income. However, if the investment management services for which you paid are connected to the account from which you receive tax-exempt income from municipal bonds or bond funds, the related expenses are not deductible. • Sale, Call or Redemption of Bond – Normally, the sale, call before maturity or redemption of a municipal bond is treated in the same way that a taxable bond is. If you held the bond long enough, any gain is taxed at favorable rates. Capital losses can be used to offset other capital gains. Up to $3,000 of any remaining losses can generally be applied against other income, with a carryover of any excess to later years. • U.S. Government Bond Interest – By federal law, the states cannot tax the interest income of direct obligations of the U.S. Government (but it is federally taxed). This includes interest from U.S. Savings Bonds, U.S. Treasury bills, notes, bonds or other U.S. obligations. Interest earned from the Federal National Mortgage Association (Fannie Mae), Government National Mortgage Association (Ginnie Mae) and the Federal Home Loan Mortgage (FHLMC) Corporations are not direct obligations of the U.S. Government and therefore are not excludable from state taxation unless specifically allowed by state law (generally not the case). If you reside in a state with no state income tax, U.S. Government Bond Interest provides no tax benefit. • Itemized Deductions – If you do have a state tax and the investment is tax-free in your state, then whether or not you itemize your deductions on your federal return also makes a difference. When you do itemize deductions, the state income tax you pay is included as a deduction on your federal return. Because having state tax-free income reduces your state tax, the reduced state tax lowers your itemized deductions and increases your federal tax. (If, instead of deducting state income tax, you deduct state sales tax because the sales tax amount is more, then whether or not you itemize deductions should not affect your decision to purchase a taxable or non-taxable investment). • Municipal Bond Funds – If you are looking for diversity and professional management for your municipal bond holdings, you may want to consider buying shares of a fund that invests in tax-exempt municipal bonds. These funds may be broadly based or targeted to a particular state’s bonds. Dividend municipal bond funds are essentially treated in the same way as municipal bond interest is. To preclude a potential tax loophole, if an investor buys fund shares, receives an exempt-interest dividend and sells the shares at a loss within six months after the purchase, the loss is disallowed to the extent of the exempt-interest dividend. 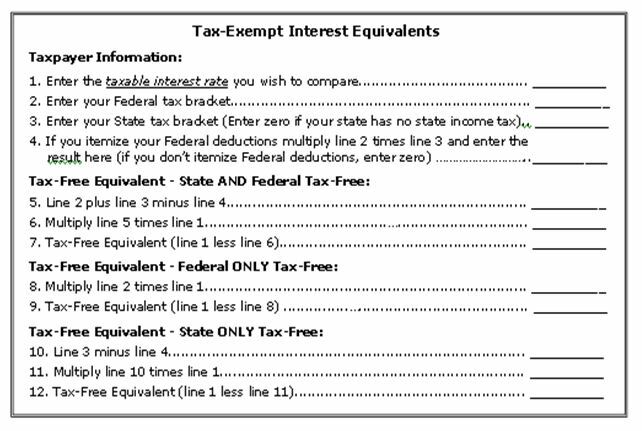 Use the worksheet below to determine the tax-exempt interest equivalents for your particular tax bracket, state tax (if applicable) and type of tax-exempt in investment. Enter all rates in decimal format, and carry all calculated values to at least four places after the decimal. For example, 5.75% would be entered as .0575. CAUTION, because the 3.8% surtax on net investment is only based on investment income or AGI in excess of certain levels, it is not accounted for separately in the worksheet below. Taxpayers below the high-income thresholds would not add the 3.8% to their marginal tax brackets when entering their federal tax brackets on line two of the form, while those who have incomes that are substantially greater than the thresholds would. Give Bressler & Company a call at 559.924.1225 if you would like assistance deciding whether to make a taxable or tax-free investment. Making the right decision for your particular circumstances can have a significant effect over long periods of time.